"You can't compete externally, if you can't first collaborate internally"
Harrison Assessments Behavioural Competency suite includes assessments based on the groundbreaking Radical Collaboration program developed by Jim Tamm. They act as a how-to manual for anyone who wants to create trusting, collaborative environments, and transform groups into empowered teams. 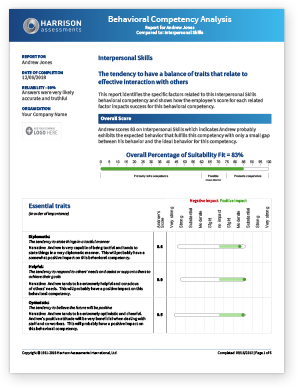 Our Collaboration Competency reports are generated from the same SmartQuestionnaire data used by almost all Harrison Assessments talent functions. By understanding and reducing our own defensiveness we can consciously choose to adjust our behaviour. This has the benefit of reducing rigid thinking and reducing the likelihood of defensiveness in others. Research shows that reducing this defensiveness increases our ability to solve problems and produces more output. This defensiveness is an emotional reaction where we have lost control. Harrison's Paradox Theory is unique in its ability to accurately assess these amigydala hijacks and provide the self awareness and understanding that underpins true development. This self awareness acts like an early warning system that allows us to identify and take back control. 1. Collaborative Intention: Stay non-defensive and commit to mutual success in relationships. 2. Truthfulness: Create a climate of honesty and openness that allows people to feel safe enough to discuss difficult issues. 3. Self Accountability: Take responsibility for the consequences of your actions. 4. Self Awareness & Awareness of Others: Know yourself and others well enough to explore difficult interpersonal issues. 5. Problem-solving & Negotiating: Negotiate your way through inevitable conflict in a way that supports relationships.